First runner up is the first loser. No, I am just kidding. I am totally thrilled Cision picked me and my neurotic ralfbecker.com-blog as No. 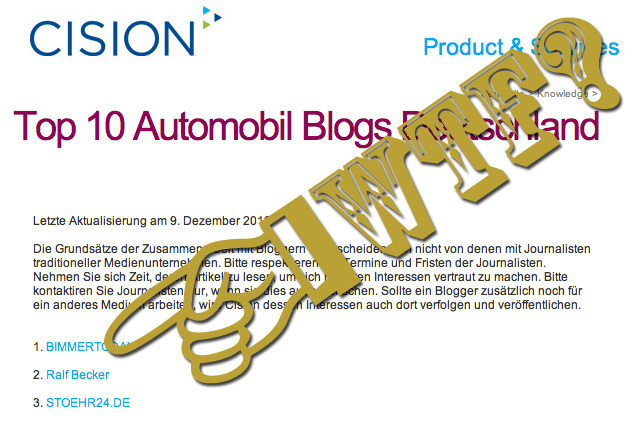 2 in their "Top 10 Automobil Blogs Deutschland". It seems like we did a couple of things right throughout the last five years. And it seems like our work has enriched automotive media and marketing as well. Which is awesome! "Your Story. Covered. You have a story to tell. That much never changes, but the way you get it out does. Every day brings new technologies, outlets and contacts. And every media response can change your public image, for better or worse. Whether you're a communications professional or a member of the media, Cision brings together all the elements you need to find the right leads and sources, target the right editors and publications, get coverage and achieve measurable results. Cision - where the media and PR connect." If you want to know more about Cision's blog ranking methodology — here is a short overview. Oh ... did I mention I am thrilled?